In the Weber Center's Room 420, two projectiondesign DLP projectors give instructors the ability to show two images side by side on a motorized projection screen.OELGIN, IL--Though somber winter hues now color most of the campus of Judson University in Elgin, IL, a cheerful green at the new Harm A. Weber Academic Center continues to turn heads. The "green" building is largely heated and cooled from an enormous interior well that runs up the center of the building. On warm days, cool air from underground is drawn up the well and released into the building. When the building needs heat, the computerized system opens a shade at the top, allowing the sun to warm the air in the well. 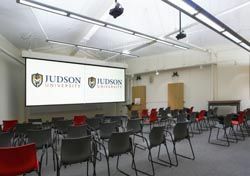 In the Weber Center, engineers from Sound Vision, Inc. (SVI) were careful to use only EnergyStar-rated projectors and audio gear to help minimize the power consumption of key components. "We also programmed the AMX system to make sure that those projectors are not left on by accident during off hours or when the building is closed," said Tom Allison, systems sales consultant at SVI. "In addition, each equipment rack goes into standby mode when not used, then shuts down, ensuring that the amplifier and other equipment consumes very little energy." One challenge of the building's green design was the massive concrete walls and floors it required. "Ideally, we should have been involved very early in the design process, to ensure that the conduits needed for cabling to our racks and equipment were embedded in the concrete," Allison said. "That didn't happen, so we went to Cat-5 transmission, which allowed us to rely on smaller-diameter cabling that fit within the available 3/4-inch conduits." The biggest challenge in these rooms was reverb from the concrete walls and floors. "I was worried about intelligibility," Allison recalled. "It's like being in a church where the reverb is eight milliseconds and you can't understand a word that's said." Careful placement of loudspeakers headed off the problem. The Weber Center is the first building on the 44-year-old campus to have built-in AV systems. SVI designed fairly basic systems for five of the eight new classrooms, with ceiling-mounted Panasonic DLP projectors and motorized or manual wall screens. Allison found a way to bring the rooms onto a building-wide control network using AMX AssetManager software. "We wanted the university to be able to monitor the status of these rooms and help any instructor with a problem," he said. "They can check the lamp life, notify security if a projector has been stolen, and anticipate equipment failures." The software also tracks data on how often each room is being used and what equipment gets used the most. To help make all this possible, SVI engineers squeezed these rooms' control functions onto a 4-inch AMX Modero touchpanel, they did without separate DVD players or other video sources (relying on each room's dedicated computer as the only source for projection), and they put the audio amplifier into the ceiling to avoid a separate equipment rack. Nonetheless, the rooms are popular with instructors, who appreciate the built-in systems, sensible controls and readily accessible tech support. SVI engineers designed more sophisticated systems in three larger classrooms. Each of these rooms includes multiple video sources, a sound reinforcement system with gooseneck and lavaliere microphones, a larger AMX touchpanel, and single or dual projection systems. The growing list of technology in these three classrooms created the need for a teaching station that would put equipment and control at the instructors' fingertips. To this end, SVI brought in Marshall Furniture of Antioch, IL to design a custom lectern. The lectern is unusual in that it offers three separate work surfaces plus a built-in equipment rack, all on a 30- by 20-inch footprint. Marshall's Michelle Wille says that the university did not want so large a lectern that the instructor felt hidden from view and separated from his or her students. "The challenging part was to come up with a way to make it function properly and make it all fit." The final design includes a 20- by 30-inch flat top that holds a 15-inch iMac monitor and a 7-inch touchpanel, a pullout keyboard drawer, a 24-inch pullout shelf for a document camera or extra paperwork, and an 18-inch attached, angled work surface to hold a textbook or lecture notes. The most impressive of the Weber Center classrooms is Room 420, the primary architecture classroom. SVI installed two 1400 x 1050 projectiondesign DLP projectors, giving instructors the ability to show two images side by side on an enormous motorized projection screen. At times they'll compare design drawings, AutoCAD drawings, or architectural renderings from two computers, or show computer graphics on one screen and DVD video on the other.